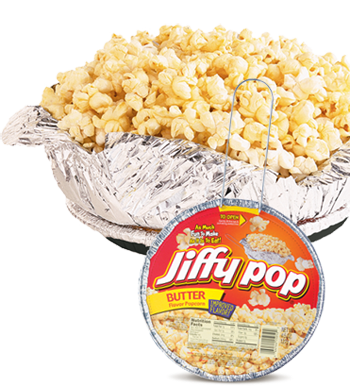 Jiffy Pop is a brand of popcorn. It’s not microwavable and it’s not pre-popped. It comes in an aluminum pan with a foil cover that you can heat up over an oven or open flame. It’s the best tasting popcorn in the world if you manage not to burn it. That’s because it takes considerate skill not to burn it. You’ve truly earned it if you make Jiffy Pop right. That makes it taste better. Jiffy Pop used to be common in the household. Now you mostly see it while camping or at bonfires if you see it at all. There’s no need to manually cook popcorn if you have a microwave handy. Jiffy Pop had its glory days. It’s time we all moved on, but there’s nothing wrong with a little nostalgia from time to time.